When it comes to sorting stuff, one of the worst algorithms you can use is known affectionately as bubblesort. It is sooo terrible, that people have stopped naming kids after it. Despite its terribleness, it is important for you to learn how bubble sort works. The main reason is to understand what it does and...avoid doing anything in your code that even remotely resembles it. The other reason is purely for trivial purposes. You'll never know when Alex Trebek belts this out as a Final Jeopardy answer one day. The first two numbers are compared. Then the next two numbers are compared. Then the next two, and the next two, and so on. You get the picture. The comparison it performs is to see if the first number is smaller than the second number. If the first number happens to be bigger, then the first and second numbers are swapped. Let's walk through this briefly. From bubblesort's point of view, your numbers are considered to be perfectly sorted when you make a pass through your numbers without having to swap any of them around. To put it differently, it means that every two consecutive numbers you looked at were properly arranged from small to large. Don't worry. Since we are dealing with bubblesort, these four numbers itself will ensure you do a lot of scrolling (or page turning or hand gesturing) to get to the fully sorted version of things. You've already sorta (ha!) seen the first few numbers, but we'll go through them again with a little more detail for the sake of completeness. When no swaps happen, it means that every number is properly arranged. That signals to bubblesort to stop bothering these poor numbers and to go home. If you walk through this code, everything you see should map to what we looked at in the previous sections. The main thing to call out is the swapSignal variable that I use to indicate whether bubblesort has gone through these numbers without swapping any values. Besides that one thing of note, everything else is just simple array and for loop tomfoolery. As you've seen from the walkthrough, bubblesort is not very efficient. 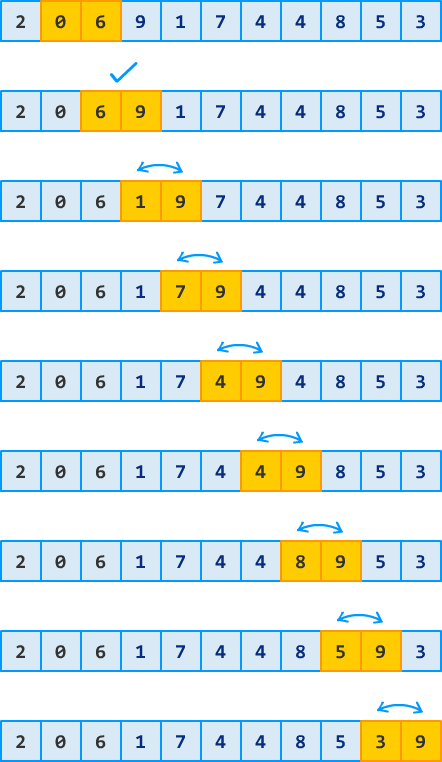 For sorting four numbers, it took about 18 steps if you count the shifting and comparison as two individual operations. This was despite several numbers requiring no further sorting. Bubblesort is fastest when you are already dealing with a fully sorted list of numbers. It goes through the numbers once, realizes that no numbers were swapped, and then heads over to the local discotheque and does some...discotheque-ing with all of the other cool kids. If you are dealing with a list of numbers that are sorted in reverse, bubblesort takes the longest amount of time. Every single number needs to be swapped and moved over to the end. I feel bad for whatever computing device has to deal with that reversed situation. And with that, you are free to go and use your newfound knowledge to sort all sorts of things really REALLY slowly. 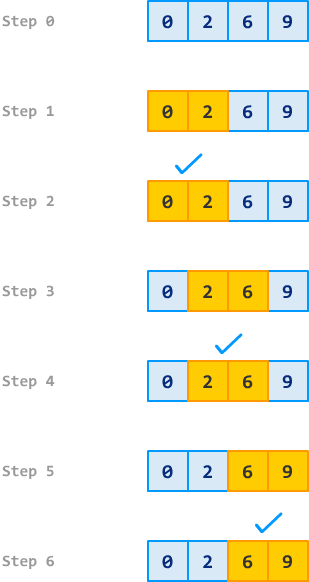 If you want to learn about a fast sorting algorithm that leaves bubblesort behind in the dust, you really should become friends with quicksort.